Land was explored, frontiers were advanced, and "backcountry" converted into settlements because colonists sought wealth in the New World. Native Americans who occupied the land which was key to the accumulation of colonial wealth were not willing partners in the transformation of North America. The paramount chiefdom of Powhatan was only the first of many to resist occupation by negotiation and by force, only to fail and have the pre-existing society dramatically disrupted. For a century before Jamestown, Englishmen had been making a profit from the New World. Most profits before colonization came from fishing in the cold waters off the mouth of the St. Lawrence River. After 1607, vast amounts of cheap land was the Virginia colony's great asset. Native American claims to their traditional territories were not a barrier to "land hungry" English settlers. The Algonquian-speaking tribes in Tidewater, plus the Iroquoian-speaking Megherrin and Nottoway, were constrained to reservations or isolated areas by the end of Bacon's Rebellion in 1676. 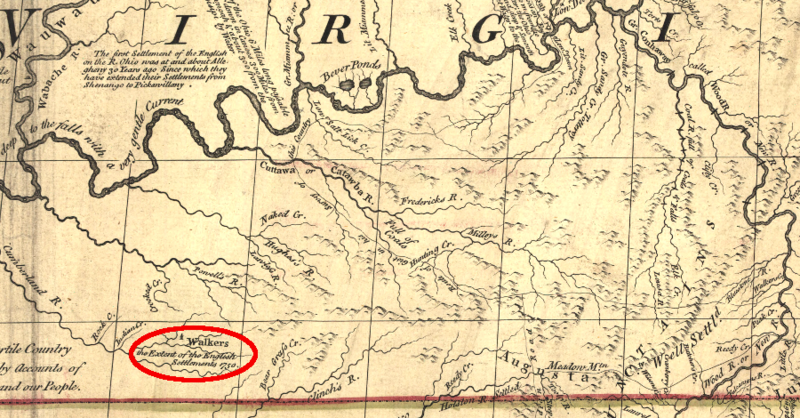 The Siouian-speaking tribes in the Piedmont were displaced soon afterwards. Through tobacco farming, initially with immigrant labor and later with slave labor, the European immigrants were able to profit from that land. In the days before the Industrial Revolution created a middle class and wealth could be acquired through manufacturing, land for producing crops, wool, meat, and wood products was the basis of English wealth. Land was controlled by the hereditary aristocracy. Peasants had little opportunity to climb the social ladder and join the aristocracy, and little chance to become landowners with control over their own farms. Roughly half of the population in England owned no land. No matter how hard they worked, those who did not inherit land had little expectation of acquiring it. An alternative to a lifetime of frustrating, never-ending poverty in England was emigration. Travel across the Atlantic Ocean was unpleasant and dangerous, and moving to the Virginia colony was a great risk. However, emmigration was the easiest way for many Englishmen to become landowners, and Virginia offered an opportunity for the minor gentry and even lower classes to climb into the upper ranks of wealth and power. Speculation in land across the Atlantic Ocean spurred changes in traditional business practices in England. The Virginia Company was an early expression of a relatively new economic approach, the joint stock company. It was a legal tool where investors could pool their capital and risk, then share the rewards as a "corporation" rather than as individuals. If the speculative colonization venture failed, the investors' funds disappeared - but only those funds were put at risk, not the entire personal wealth of the investor. After 1607, the English extinguished or finessed the Native American land claims and successfully prevented rival European nations from settling in the Chesapeake Bay. According to English law and custom, the king was able to grant a great swath of North America to the investors in the Virginia Company. The company tried to hold the land in common, but then began to grant it to groups and individuals in order to spur settlement. After the company charter was revoked in 1624, royal governors granted rights to vast tracts of Virginia in the name of the king, while individuals were able to acquire smaller parcels through headrights and Treasury rights. The intrusion of Europeans dramatically changed the Native American cultures that existed before the Contact Period. 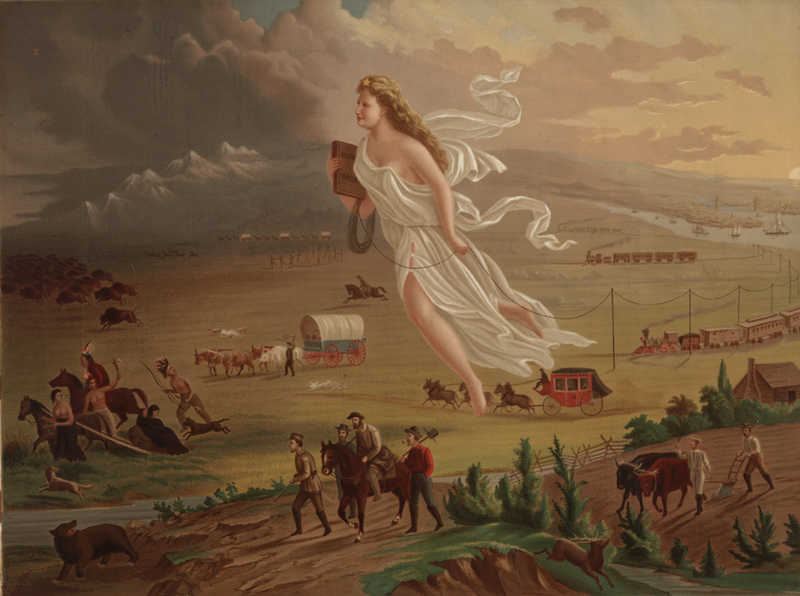 During that Contact Period, the cultures of the European immigrants also changed. A new American culture emerged on the edge of European settlement, away from the "cultural hearths" of Europe. Both Native American and European patterns of living were transformed by interactions on the edge (frontier) of colonization. The aristocratic society of Europe was mimicked in Tidewater Virginia, with an elite gentry establishing political and social control over most colonial resources in the 1700's. The pretensions of the First Families of Virginia (FFV's) are still reflected in the brick mansions and Anglican churches east of the Fall Line. A revolutionary political concept, representative government without rigid social barriers based on heredity, also emerged in Virginia. Male landowners got to vote for members of the House of Burgesses after 1619, shaping Virginia society through a process that was not possible for the average citizen back in Europe. The original lifestyle in the Virginia colony reflected the old class-based society in Europe, where a person's social status, economic opportunities, and political rights were defined at birth. The first president of the council at Jamestown, Edward Maria Wingfield, was accused by John Smith of hoarding food for his own benefit at the expense of the other hungry colonists. until the latter part of the seventeenth century, the members of the governor's council were exempt from taxation; and only they, according to an early statute, could wear gold braid on their clothes. The shared difficulties of living on the American frontier, including the threat of Indian attack, helped to level the differences. The challenges of living far from traditional civilization provided the setting for a new culture to emerge, one based more on merit rather than on family heritage. 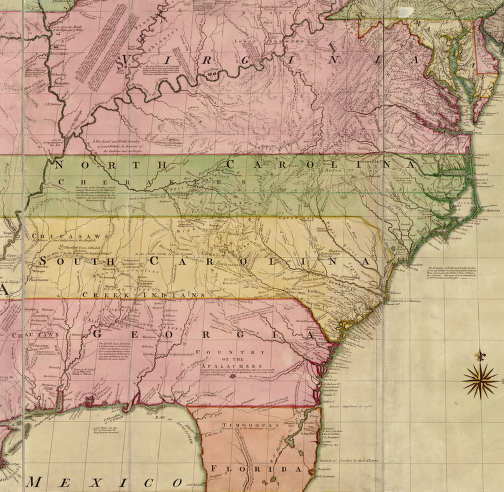 Individuals could not change their genealogy, but colonial Virginia offered the potential for a person to acquire wealth through initiative and accomplishment even if their family connections were limited. The opportunity to acquire land in colonial Virginia led to a Virginian legal and social system that was substantially different from Europe. Indentured servants were lured to the colony through promises of land, and the system of headrights encouraged wealthy investors to acquire large tracts of land and "plant" them with settlers in order to gain title. Explorers like Daniel Boone led the way for many farmers to clear the forest (or clear out the Native Americans) and get started with crops such as corn. Like Boone, not all settlers were savvy enough to retain their property, but many managed to provide a substantial inheritance to their children that would have been impossible in Europe. The availability of so much cheap land did not guarantee that Virginia society would be more democratic than in England, and plantation agriculture based on tobacco led to slavery. The availability of labor determined how much tobacco could be produced in Virginia, while in England the amount of land owned by a farmer was the limiting factor for production. The Native Americans in Virginia were largely eliminated or expelled rather than converted into a subservient workforce. The supply of indentured servants from Europe was inadequate by the 1660's, so the colony increased its reliance on laborers who had not chosen to come to Virginia voluntarily. Virginia law evolved in the 1600's to create the status of "permanently enslaved" for blacks imported from the Caribbean and Africa. To maximize the profit potential, England chartered the Royal African Company in 1672 to transport slaves to Virginia and other colonies, replacing the Dutch. Democracy as we know it today in the United States did not arrive full-blown on ships filled with colonists; it continues to evolve over time in America. Virginia gentlemen were the revolutionaries who wrote the Declaration of Independence and shaped the Constitution, yet the same Virginia gentry depended upon slavery for their wealth. George Washington was the "indispensible man" in converting democratic concepts into an operational government, one where various factions were able to resolve their conflicts through peaceful elections rather than intermittent revolutions. As a teen-age surveyor, he mastered the challenges of fending for himself far from the comforts of the William Fairfax home at Belvoir. As a 21-year old, he travelled over 1,000 miles on a wintertime expedition from Williamsburg to Fort Le Boeuf, near Lake Erie. Washington, for all his capabilities, had no solution to the challenge of slavery. His personal choice was to free his slaves, but only after his death. Few members of the Virginia elite followed his example. The concept of frontier is often confused with a bright-line boundary, an edge between two places. In descriptions of colonial Virginia, the term "frontier" is often used from just the point of view of the English culture. Fur traders penetrated into the "backcountry," the territory beyond the frontier. As the colonial population expanded, Native American cultures were forced to surrender land, pushing back the "frontier." From the viewpoint of Algonquian-speaking Native Americans, the "backcounty" was Jamestown and Williamsburg. The territory that colonists considered to be "settled" was visited by Native Americans such as Cherokee leaders sailing to London. Native Americans penetrated into the backcountry along the eastern seaboard just as fur traders visited Shawnee and Delaware towns west of the Ohio River, but rarely is the "civilized" area occupied by Europeans described as backcountry. Abernethy concluded that "frontier conditions do not necessarily produce democratic institutions, even when the lands are easily accessible to independent small farmers." The frontier experience was not a standard force, dependent just upon the distance between two groups and comparable to gravity or magnetism. Life in the backcountry and on the frontier changed at different rates, in different places, as settlement moved inland. The impacts of colonization varied on the different Europeans who settled Virginia, who brought different cultural patterns with them. The ability of the Virginia gentry to obtain ownership of large tracts of Virginia land at extremely low cost enabled them (and owners of large tracts in Carolina) to compete successfully with William Penn for colonists and delayed settlement of the upper Ohio River Valley. The willingness of the gentry to sell that land varied - Lord Fairfax was slow to market his properties, for example, so that delayed permanent European settlement within the boundaries of his proprietary grant. Migration inland from the Fall Line did not follow each river valley equally into the Piedmont, and the Roanoke River valley in particular was slow to develop. 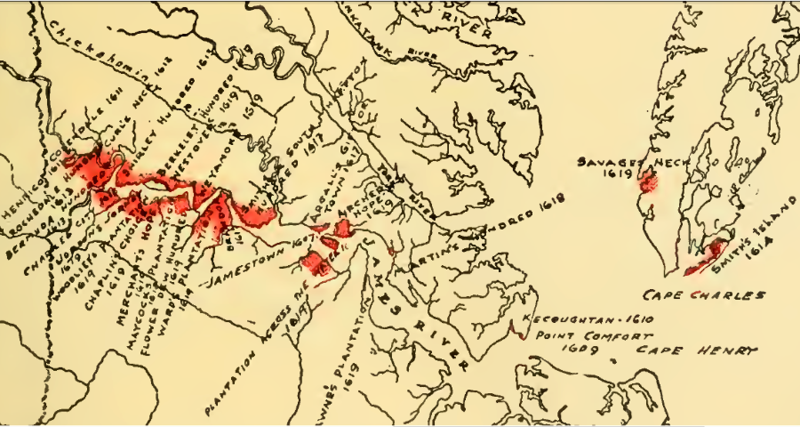 English settlement was slow to move into the Piedmont, upstream past the Fall Line of the James, Appomattox, Pamunkey, Mataponi, Rappahannock, and Potomac rivers. The Coastal Plain was more attractive, with direct access to navigable rivers. Ocean-going ships could dock at a plantation's wharf and collect tobacco "prized" into hogsheads, minimizing the headache of moving cargo across land where there were few roads. 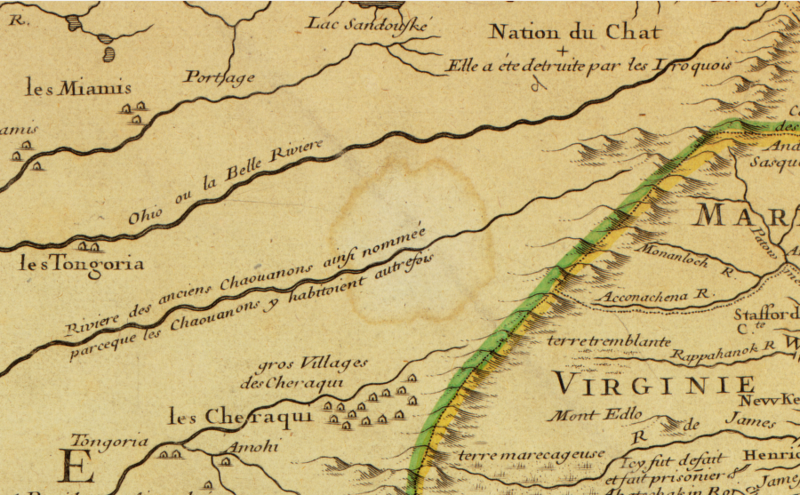 The first settlers to move upstream of the Fall Line on the James River were French Huguenots, Protestants who had fled France after King Louis XIV revoked the Edict of Nantes and persecuted non-Catholics. The Huguenots were sent across the Atlantic Ocean in 1700 by King William III, who was governing alone after the death of Queen Mary. The English king was hoping to increase the population in his royal colony of Virginia and to decrease the number of French refugees in England itself. William Byrd I had sought to have them located near lands he owned upstream of the Fall Line. William III directed that the Huguenots be settled instead on lands near Norfolk that were owned by the court physician. Despite the king's direction, when the refugees arrived the colonial governor in Virginia (Francis Nicholson) sent them to the James River upstream of Byrd's property. The House of Burgesses determined in 1704 that each family would be given 133 acres, and William Byrd I survey a 10,000 acre tract along the James River for those claims. The interest in the Huguenots was not merely altruistic, for he owned large tracts of land in the vicinity to which he wished to attract settlers, and this could better be accomplished if there were a settlement at the old Indian town-site to act as a buffer between his lands and the marauding Indian tribes which sometimes descended upon them. Migration south through the Shenandoah Valley did not lead automatically to Tennessee, with the overflow spilling through Cumberland Gap into Kentucky. 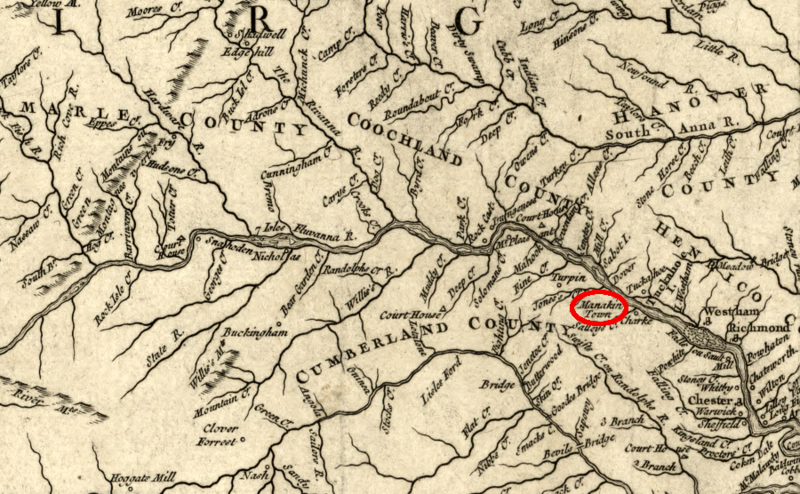 Some settlers followed the Roanoke River to its headwaters, cross the New River, then stay west of the Blue Ridge to reach the headwater of the Tenneesee River. Other early groups of Scotch-Irish Presbyterians, Moravians, and Quakers cut through the Blue Ridge. 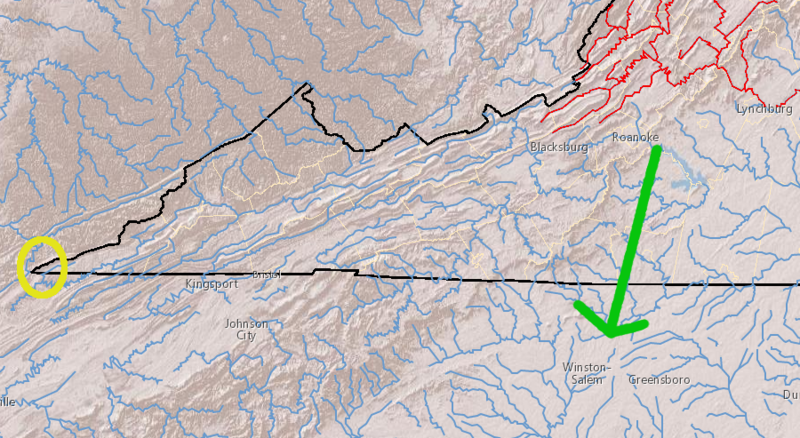 The Smith Mountain Gap of the Roanoke River allowed easy passage to the Piedmont of Virginia and Carolina, east of the mountains. The virgin soil in the Piedmont was still fertile, and access to markets along the Fall Line were easier. 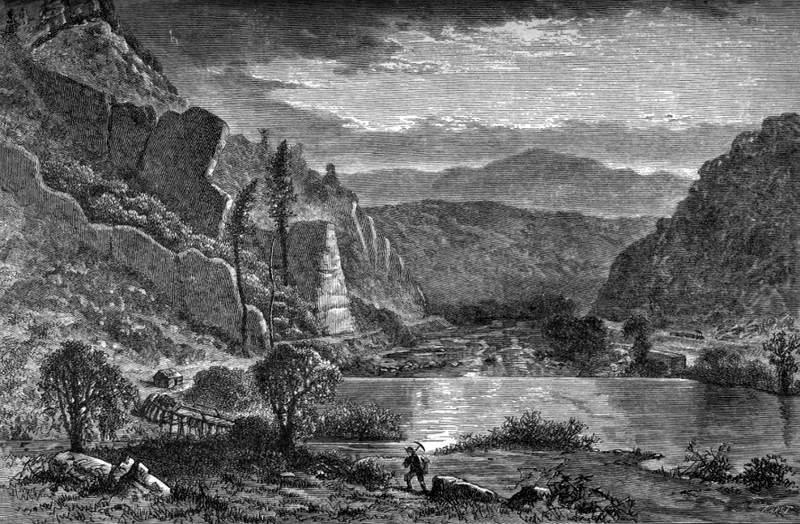 It took an additional 20-25 years after Thomas Walker explored the Cumberland Gap before the valley of the Yadkin River became "crowded" and the power of the Shawnee and Cherokee were diminished. Only then did Pennsylvanians float down the Ohio, and Virginians and Carolinians follow Daniel Boone and others into the bluegrass territory. The westward movement did not roll forward with an orderly and irresistable force like the waves of the sea. On the contrary, it was as fitful as a mountain stream, now swirling, now eddying, and its course was deflected by many crosscurrents. The character of Virginia's immigrants west of the Blue Ridge was different when they arrived from Pennsylvania. Local architecture of colonial churches built by the Anglican English in Tidewater and by the Scotch-Irish Presbyterians in the Shenandoah Valley reflect those difference physically, but patterns of speech, farming practices, and town development are also distinctive. West of the Blue Ridge, the challenge of transporting crops to market, together with the different cultural background of the original European settlers, led to a dramatically different agricultural economy. Shenandoah Valley farmers grew grain and livestock rather than tobacco, and had little interest in owning large gangs of slaves to work the fields. 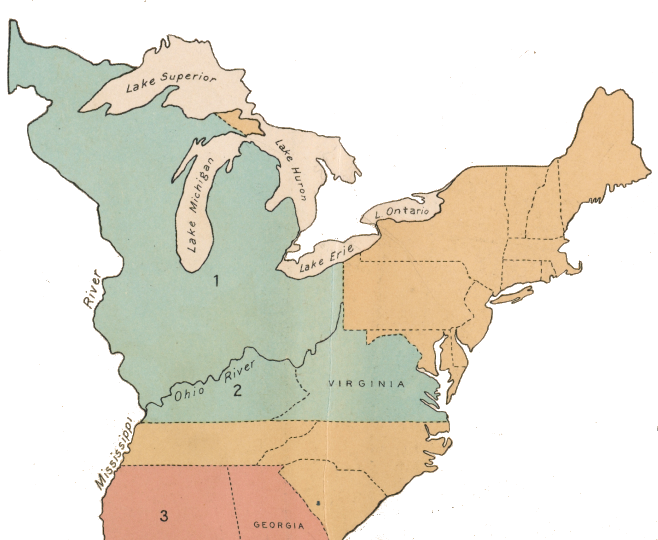 The far southwestern counties of Virginia struggled with the distance from the capital in Tidewater, different priorities regarding the security threat from Native Americans still in the Ohio Country, and reliance upon the transportation channel of the Mississippi River vs. the Chesapeake Bay. Those differences led to a peaceful separation from the rest of Virginia and formation of the new state of Kentucky. In the northwestern counties across the Eastern Continental Divide, the cultural and economic differences ultimately led to the political separation of the far western counties and creation of the state of West Virginia. 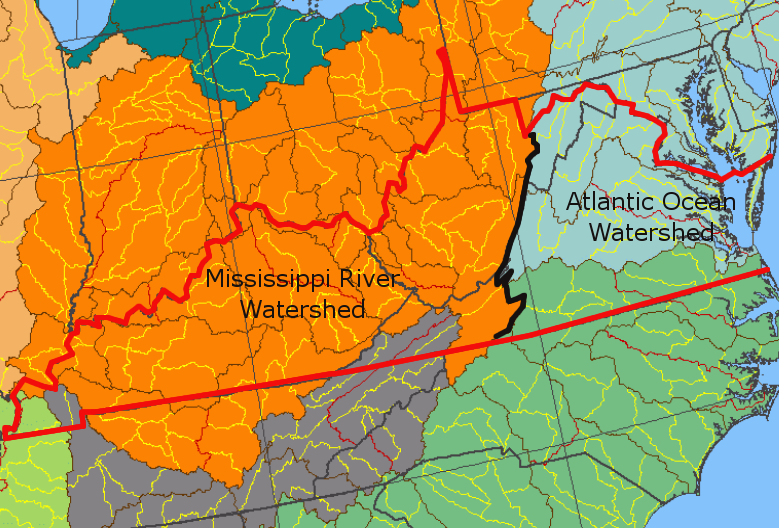 As a result, modern Virginia boundaries no longer touch the Ohio River, despite all the efforts of the Tidewater-based elite to seize and then exploit that territory. Early Settlement Up the... Rappahannock? Travels in the American colonies - see "Diary Of A Journey Of Moravians From Bethlehem, Pennsylvania, To Bethabara In Wachovia, North Carolina, 1753"
English claims to land in the Ohio River watershed in the 1750's were based in part on supposed conquest of the Six Nations in New York, and in part on physical occupation of the "waste land"